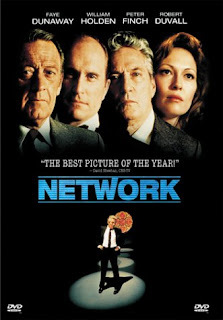 Network is probably the greatest script ever written. The best dialogue, for sure. And the actors deliver performances that will have you gasp. The direction? This is a film by Sydney Lumet himself! Network will have you screen-tied from the very start, yet the question it seems to ask is simply: Is entertainment evil? Ironically you cannot wait to see what the answer will be at the end. So, what is not so good about it? One thing: The fact that very few people seem to be aware of its existence. When I stumbled upon rave reviews of this film, I was puzzled by the fact that I had never seen it on TV. After watching it, I don't find it strange anymore. That would be TV committing hara-kiri.